Data Interpretation (DI) is based on deriving and interpreting solutions of the problems relating to tables, bar graphs, pie charts and line charts. DI requires a lot of data to be solved in the least time possible. In other words, the aspirant needs to interpret a lot of data in the fastest way possible to come up with the right answer. Practice daily DI questions so as to minimize your calculation time. Mind calculations, as far as possible, by way of approximation of values, are a better strategy to reduce time rather than actually multiplying or dividing the data on extra sheet (usually back of the question paper), with the help of pen/pencil. The aspirant must watch the data carefully and not to mix up the data of one year with that of another year. Speed with accuracy is the best strategy to tackle DI questions. This is the simplest form of presenting the data and most widely used in DI section of almost all the competitive exams. In tables, data is given in rows and columns. Read the table given below and answer the question accordingly. The total of high rates of all three stock exchanges comes to Rs. 28 + Rs.28.25 + Rs. 29 = Rs.85.25 and thus the average comes to 85.25/3= Rs. 28.42. Hence, the answer is 1st option. Average has to lie somewhere in between the two extreme values. Here, the values are 28, 28.25 and 29 – and leaving the extreme values, the choice comes to Rs. 28.25 and so automatic choice comes to 1st option (closer to the approximate value) and that is the correct answer. 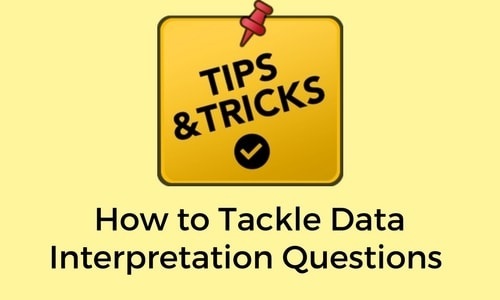 These are one of the most frequently used methods of presenting various types of data. Questions based on such type of charts are very common in almost all the competitive exams. Bar chart is graphical representation of data wherein vertical bars are placed equidistant from each other. The value of the data in a bar chart is given by the length or height of the Bars in a Bar Chart. The width of the Bars is used for the clarity of the presentation. Generally there are 4 types of Bar Charts on which questions are asked. These 4 types are: (a) Simple Bar Chart: This is the simplest form of Bar Chart in which single bars are placed at equal distances from each other; (b) Composite Bar Chart: In order to show two or more continuous variables a composite Bar Chart is used; (c) Stacked Bar Chart: These are used to represent the break-up of continuous variables. This type of Bar Chart is generally used to compare two or more sets of data; and (d) Bar Charts to show Deviation: Bar Charts that show deviations are generally used for graphic presentation of data which can have both positive and negative values such as profit or loss, import or export, etc. Study the following graph and answer the questions given below. Foreign Exchange Reserves are given in Billion $ of US, UK and India respectively for four different categories. The foreign exchange reserve of India in category 4 is what percentage of foreign exchange reserves in category 1? Foreign exchange reserves under category 1 are exactly touching the line of 2; whereas under category 4 these are exactly touching the line 5. So percentage required is 5/2x100 = 250% and thus Option C is the right answer. These can be subdivided into two parts: (a) when the values are given in the percentage terms; and (b) when the values are given in degree of angles. A pie graph (or pie chart) is a specialized graph used in statistics. The independent variable is plotted around a circle in either a clockwise direction or a counter-clockwise direction. The dependent variable is rendered as an arc whose measure is proportional to the magnitude of the quantity. Each arc is depicted by constructing radial lines from its ends to the centre of the circle, creating a wedge-shaped "slice." The percentage of all the sections must come = 100 or if denoted in degree of angles, then the total of all the sections must come to 360 degrees i.e. full value of degree of angles in a circle. Given that 59% of the sales of the Honda Company come from sale of Cars, 23% from the sales of Motor Cycles, 10% from sales of Activa and the remaining 8% from the sales of spare parts. Total Sales just for calculation amount to Rs.100 Crores. If car unit goes on strike, how much fall would there be in overall sales if the sales of the other three sections are doubled? The total sales were Rs.100 Crores prior to strike in the car unit. Loss due to strike = 59 Crores but sales of other units doubled i.e. from Rs.41 Crores to Rs. 82 Crores. Thus overall loss is = 59 – 41 = Rs.18 Crores or 18% and thus Option C is the right answer. A modified version of Bar Graph representation is said to be a Line Graph. On connecting the upper points of two adjacent Bars of a Bar Graph we get a line and on further repeating this procedure with other Bars we get a Line Graph representation. Problems based on line graphs appear frequently in competitive exams having data interpretation as a component. Study the following graph carefully and answer the questions given below. Series 1 represents the net profits during the year, Series 2 represents the expenditure during the year and Series 3 represents the volume of sales during the year in Crores of Rupees. In which of the following years was the percentage increase in net profits over the previous given year the maximum? Since 2011 is the base year, it cannot be the answer and so option B is totally wrong. In 2013, the profits have actually fallen and so it cannot be the answer and so Option A is also wrong. But there is a steep rise from 2013 to 2015 thus Option C is the right answer. (From 2015 to 2017, there is steep rise in sales’ volumes but not correspondingly in the profitability).